Ukab Maerd is a project conjured up by two founding members of Djam Karet, Chuck Oken, jr. and Gayle Ellett. The name of the band is merely Baku Dream written backwards, a reference to Djam Karet's 2003 album, A Night for Baku. Djam Karet are known for the many facets of their music, including a very crunchy guitar sound, so anyone expecting to find more of this on Ukab Maerd's debut album The Waiting Room (perhaps a Genesis reference) will have been in for a surprise (pleasant or not). Oken and Ellett have namely decided to form a side project which is dedicated to progressive electronic music and they unabashedly wear their influences on their sleeves. The Baku (from the name of the band) are supposedly spirits that eat bad dream and nightmares and in a way the music reflects this, with both some nightmarish parts and some sequences that bring a promise of salvation from all the evils that may attack us in our slumbers. So you have these two sides of the music, which should for all intents and purposes be in conflict with one another, but they complement each another perfectly. Just like you can’t enjoy the sunshine without knowing rain and you can’t appreciate happiness without sadness, Ukab Maerd’s music also reflects this duality. Very often the music on The Waiting Room flows like a stream, sometimes calm and sometimes dark and full of strange creatures. These changes in atmosphere often make for a difficult listening experience, yet ultimately rewarding. Towards the end, the stream seems to flow a bit more freely, as if the shackles of the nightmares have finally been broken and the light is able to show its face in all its glory. 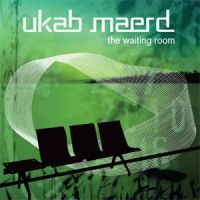 Ukab Maerd don’t hide the fact that they were influenced by progressive electronic music from the 1970s and the 1980s. Associations with Jarre, Tangerine Dream, Vangelis and the likes will often pop into your head. Just like these influences, Oken and Ellett also use the full scope of this music’s range, with all the sonic experiments, strange sounds, ambient moments and times of rhythmical bliss, where the influence on modern electronic (techno) music becomes apparent. The guys combine all these elements well, they create the right setting and still manage to come up with several memorable tunes as well. The Waiting Room is a fine modern electronic album which hearkens back to the days when the likes of Tangerine Dream reigned supreme. This project definitely seems to have a lot going for it and I think we haven’t seen the last of Ukab Maerd, or at least I hope not.